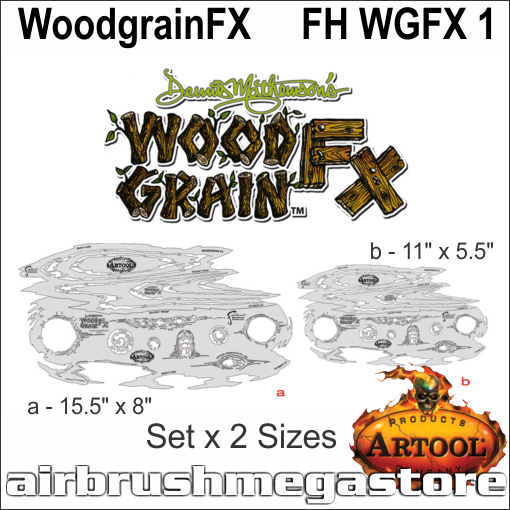 The new Artool Wood Grain FX Freehand Airbrush Templates by Dennis Mathewson in two sizes: FH WGFX 1. These new Artool Wood Grain FX Templates will give you all of the advantages that seasoned professional painters have trusted in for many years. Each size of the Artool Wood Grain FX Templates includes a Graining Template and a Knot Template. Plus, with each package you will receive a step-by-step instructional guide by Dennis Mathewson sharing secrets for you to achieve realistic wood grain effects every time.